Robin shares her first crayfish experience and provides some good tips. ON PAGE 13, the Utah fishing Guidebook states, “Fishing for crayfish (also called crawdads) is a fun activity for the whole family.” But I’m here to tell you that crawdaddin’ is not just “fun,” it’s crazy-awesome and you have got to give it a try. Crayfish are delicious, but make sure they're dead before you transport them. Our adventure happened at Strawberry Reservoir, but you can find crawdads in many waters throughout the state. There isn’t much to it, but there are two rules you must remember. First, if you’re 13 or older, you’ll need a fishing license. Second, do not transport live crayfish. Step 2. Tie a length of string to a raw chicken leg and lower it into the water until the chicken rests on the bottom. We used pink nylon string, but that’s only because my kiddo is a girlie girl and if pink is an option, pink is what we pick. Step 3. Let the chicken leg sit on the bottom for a while, maybe 5–10 minutes. Be patient. Sometimes you will even be able to see the crayfish climbing on the chicken. Step 4. Slowly pull in the string while your net is in the water. When you’re able to get the net under the chicken leg, scoop it up fast—crayfish move fast in the water. Once crayfish realize that they’re headed skyward, it’s bam, outa there. The teamwork approach works great for this step. Step 5. Whoop, holler and jump around excitedly as you plunk your catch into a cooler or bucket. Be prepared for passersby to ask what you’re doing and want to see your treasures. Crayfish are easy to handle, but grab them behind their claw legs so you don’t get pinched. This is the best gauge of the fun we had: my daughter—remember, she’s four—tended chicken legs for nearly four hours without complaining that she was hot, bored or ready to leave. We did watch some people walking back from the marina with ice cream cones, and she immediately needed one, but c’mon, it was ice cream. I wanted one too. Northern Utah: East Canyon State Park, Willard Bay State Park and Lost Creek. Southern Utah: Kolob Reservoir, Newcastle Reservoir, Gunlock State Park, Minersville Reservoir, Paragonah Reservoir and Sand Cove Ponds. Southeastern Utah: Scofield State Park and Huntington State Park. 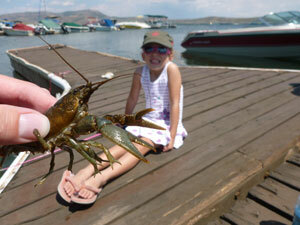 For more information on taking crayfish, check pages 13 and 14 of the Utah Fishing Guidebook. Always a pleasure to read Robin’s blog. They are sure to get people out fishing. Keep up the good work girl. Did you eat them later. HOw did you prepare them? 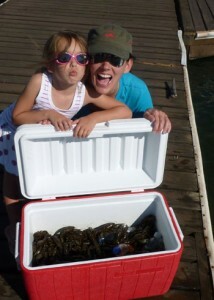 Crawdading is one of my favorite things that I did with my Dad when I was growing up. We’d always go up to Strawberry Reservoir and catch bunches of them. I had no idea that you could catch them in broad daylight. We’d always go at night. Thank you for listing other good places to fish for these around the state! I plan on taking my 4 year old this year and it’s fun to see yours really enjoyed herself. What time of year is best to fish for crawdads? Went to Strawberry 6/5/13 and caught 0. Never been skunked on crawdads before. Better later in the year? always go at night. for some reason they can’t see. they will be at your feet.. easy to catch..